MILLIGAN COLLEGE, TN (Nov. 13, 2013) — Dr. Craig Farmer will deliver a lecture, titled “The Gospel of John in the Reformation of the Sixteenth Century,” on Tuesday, Nov. 19, at 7 p.m. in Milligan College’s Hyder Auditorium, located in the Science Building. The lecture is free and open to the public. The book presents a continuous commentary on the gospel of John by translating excerpts from sources authored by 16th-century theologians. The excerpts represent theologians from the Reformed, Lutheran, Catholic and Radical traditions. The book is scheduled for release in March 2014 through InterVarsity Press. Farmer also is the author of “The Gospel of John in the Sixteenth Century: The Johannine Exegesis of Wolfgang Musculus” (Oxford, 1997). 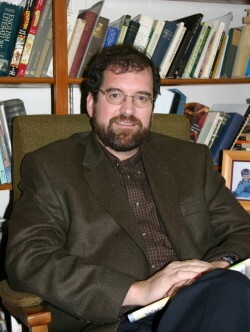 He joined the Milligan faculty in 1993. He has a Ph.D. in the history of Christianity from Duke University (Durham, N.C.), a master’s degree in divinity from The University of Chicago (Chicago, Ill.), and a bachelor’s degree in religion from Haverford College (Haverford, Pa.). His other areas of concentration include medieval and renaissance history, church history, history of Biblical interpretation and Islam. For more information about faith and arts events at Milligan, visit www.milligan.edu/arts. Posted by tommy on November 13, 2013.